The client, a US based startup, decided to create a sports platform that would support various professional and amateur sports such as European Soccer and international soccer leagues, MLS, NFL, NBA, and hyperlocal children’s soccer, baseball and basketball leagues, and build hyperlocal communities of enthusiasts. 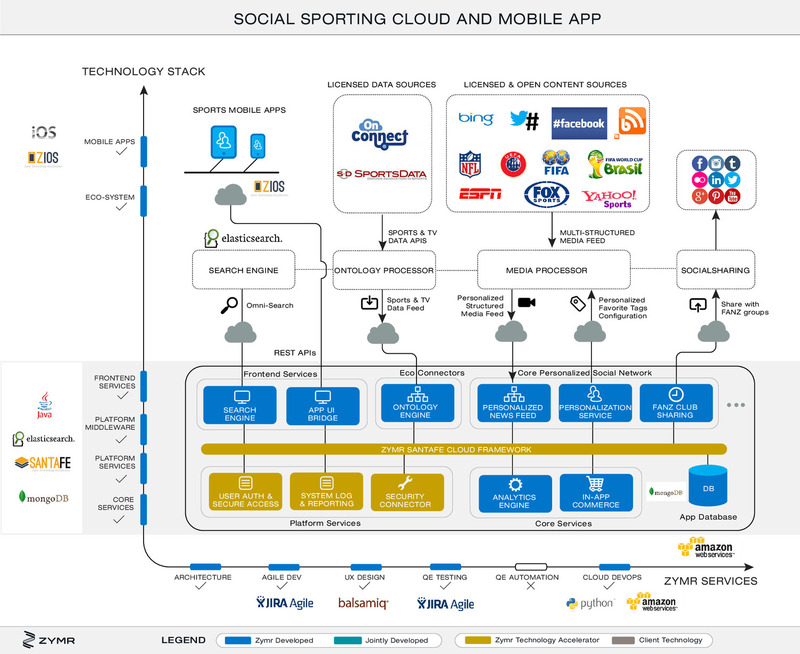 Zymr was chosen as a development partner to build a massively scalable social network platform around sports that simplified the personalization of sports browsing on mobile apps, enabled user driven content for hyper-local sporting events, provided localization options for translation in multiple languages per locale, and enabled big data analysis of sharing and viewing activities. Additionally, the platform was expected to create a business model by integrating social ecommerce, and provide multi-tenancy and white-labeling support. 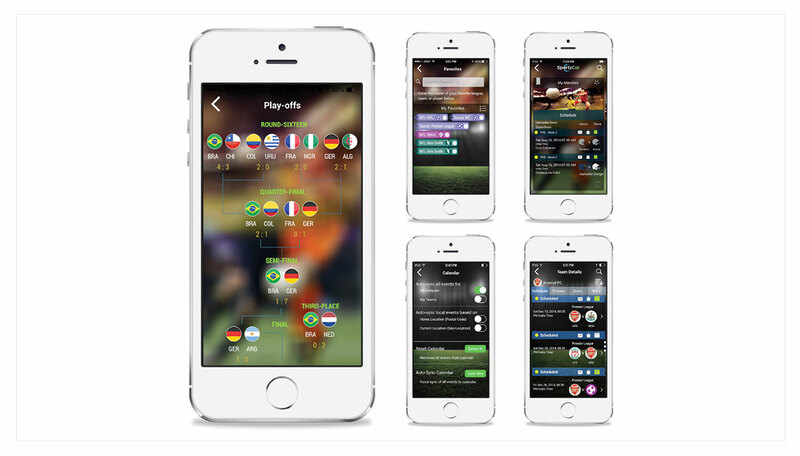 Zymr developed a UX infused social app for FIFA, NFL, NBA and MLB fans, with the initial launch at FIFA World Cup in Brazil, on a tight budget and within aggresive timelines. Zymr developed extensive and extensible multi-sports ontology that included leagues, teams, players, games, stats, etc. Zymr developed ways of processing multi-media streams of structured and unstructured data, and used a third-party machine learning technology to cluster them by topics and tags. Zymr provided user favorite tags to this engine, which tuned and personalized the content for each user. Zymr built sports centric ‘FANZ’ social groups that facilitated sharing between these groups, and also with Facebook, Twitter and other social media. Zymr leveraged ElasticSearch to develop a comprehensive in-app search based on any object stored in App Ontology Database (built using MongoDB). Zymr prototyped some user analytics of usage by users. Advanced analytics is planned for next phase. Zymr provided comprehensive UX design services for iPhone native mobile apps. Zymr developed an iPhone native app that used REST APIs to talk to the cloud server. Zymr provided extensive QE and spanned end-to-end testing services. QE Automation is planned for the next phase of this engagement. Zymr provided comprehensive services that included ability to deploy on Amazon AWS with secure VPC, data encryption and cloud monitoring services. The Zymr team developed a scalable cloud platform and the associated set of iOS apps for the client. Leveraging its proprietary SantaFe cloud middleware framework, which provided a solid extensible framework with common cloud platform services, Zymr reduced time to market and development risk for the product. In addition to providing comprehensive UX design services, and developing an extensive multi-sports ontology that included leagues, teams, players, games, stats, etc., Zymr also built features such as social sharing, search, personalization and analytics for the platform.